The bizarre, microscopic flatworm Ribeiroia ondatrae infects a chain of hosts to spread its genes. 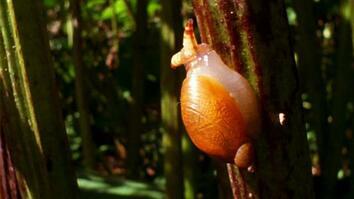 A hijacked snail floods a pond with flatworm larvae, which dig into tadpoles and cause them to sprout too many legs. As adults, the clumsy frogs prove easy prey for herons, whose droppings will spread the parasite far and wide.